For 15 years I have been a customer of El Dorado bank in a small town in California, just depositing our weekly revenues in the account and sweeping it out from time to time. When Bank of America closed a few locations we use in other California small towns, it seemed easier to just add additional El Dorado accounts. WRONG. I was told today that because we might possibly maybe make three simultaneous deposits at the three banks that total to more than $10,000 in cash in one day, we suddenly are subject to all sorts of disclosure requirements. I am used to having my privacy raped as a business owner to set up even a simple banking relationship, but now apparently any employee of mine who might make the weekly deposit is going to have to submit all sorts of personal information, including social security number, to the bank just for the ability to deposit money. We have been doing the same business with El Dorado for nearly 20 years, and suddenly in the little town of Lone Pine, CA, population 2035, we are now treated as presumptive drug dealers and tax evaders. It aggravates me that I have to put my employees in this position. It used to be that it was easier to have fewer banking relationships to manage, but now I am thinking the costs may be running the other way, encouraging more smaller banking relationships that don't trigger whatever limits are set for treating customers as presumptive criminals. I had a really bad day today. I have a 18,000 page proposal (actually 18 copies of a 1000 page proposal) due next week. I had a new color printer ordered from IKON Office Solutions scheduled to arrive last week. When I got in town this morning, I found no copier, even a week after it was promised. No call, no warning -- just no printer. I called and my sales guy had no idea what was going on, despite the fact that I had been adamant that I needed to hit this date. Apparently, he never even bothered to check the schedule. Anyway, he promised an immediate call back but never called. I called him again on his cell at noon and he acted like he had forgotten to check and promised to talk to his boss. An hour later it was confirmed -- I was not getting my equipment in time for this bid. I told them they could therefore keep it, and I would call Xerox. I absolutely cannot stand companies that require me to do constant checking and expediting in order for them to deliver on their promises. I can't tell you how many times I have been promised an immediate call-back from IKON "within the hour" for service only to have to call again and again over the following days to get any response. I would not have contracted for this new machine in the first place if I wasn't already locked in an IKON lease they won't let me out of -- this would at least have gotten me a better machine for the money. In the mean time, I prepared to do the proposal mostly in black and white with bits of color from the laser printer. I was going to use my high speed B&W copier I had under lease from IKON, and which we were planning to replace with the new machine that never showed up. I had a technician from IKON out just last week to check it so I knew it was in good shape. WRONG. Within minutes of use, the machine began spitting out horrible copies. Looking inside, it was clear something in the heat-finisher was unraveling and very broken. I called service and was given an emergency designation and assured of a call in one hour. Nothing. So I called again, and was again assured that I would definitely hear from a technician in one hour. Nothing. Now, everyone has gone home, and the messages all say they will get back to me on Monday, when it will be too late. I called my sales person on his cell phone tonight (the one that was begging me a few hours earlier, asking me what he could do to save my business) and was told there was nothing he could do and he had no way of getting in touch with a dispatcher or any real human service person until Monday. Right, they are willing to do anything for me except what they are supposed to do. So here I am, with a thousand dollar a month copier that doesn't copy, a color copier that is not here, and the prospect of spending all weekend and a couple grand at Kinko's to get my proposal out. IKON has been informed that they are now in breach of their service contract and may come by any time and pick up their boat anchor. suffer from lack of access. rigid structure with prescribed treatments which disallow deviation. here. Now imagine it with any other chronic disease you can name. What's the premise at work in a system like that? system is based on the premise that the state owns your body." you die in the mean time." leading the fight against government health care. WRONG! government intrusion into people's decisions about their bodies. 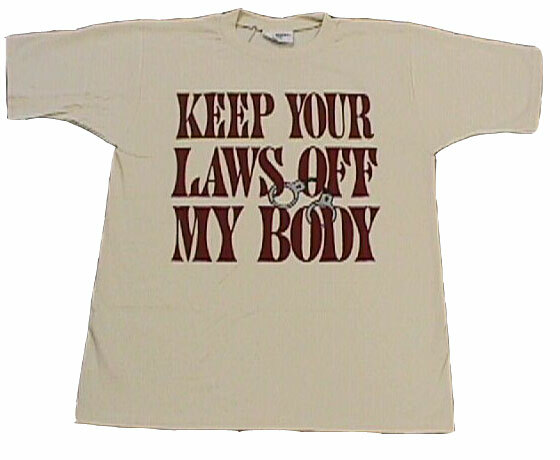 Don't miss their web site, which has sales offers for "Keep your laws of my body" T-shirts right next to appeals to "demand health care for all now." I wrote previously that I think Vista, in its current state, is inferior to Windows XP (particularly for businesses -- Directx 10 will make Vista a must for gamers). For my desktop computers, I build them myself and can still get Windows XP OEM through NewEgg. Unfortunately, for my kids new laptop, I had no choice but Vista. I have not been very happy. Here are my results so far. It is way slower than XP, even on a fast dual-core Intel machine with a Nvidia 7900 graphics card. You may have thought that the reboot and shut down process could not have gotten slower - WRONG! Shutdown alone takes forever. Unlike with XP, networking did not work right off the bat with Vista. I had to do a lot of fiddling in menus that the average user wil never find or understand to get it running.